I'm proud to be a woman, especially when I do things that so often are only reserved for men. I lift weights, heavy ones. I run by myself in the Scottish weather, rain or sun...mostly rain. I swim every once in a while, to take some time for me. It's hard making time for all of these things but it makes me feel independent and strong so I keep finding the time for it. The simple fact of things is that it's not easy to find time to get in some exercise when you have a lot going on so finding ways to do it in and around every day life is essential to making fitness part of your lifestyle rather than just part of the next diet you embark on. Women's Sport Week is a great awareness week to get all the ladies out there thinking about how to get fit. What is it though? You can keep up with the conversation on the topic of Women's Sport Week 2015 by searching the Twitter hashtag #HonestaboutExercise. We're getting in the spirit of getting women more #HonestaboutExercise by offering a few ways to get fit on a budget. Stay fit with some of these exercise hacks to kick off your new healthy lifestyle and to celebrate Women's Sport Week. It may seem like the oldest advice in the health and fitness book but a walk a day may really be what's missing in your day to day life. You don't need to run to get fit, you can walk every day to keep fit and keep your heart healthy. To track your steps why not use one of the many free apps on the store such as Pacer or Map my Walk. With the UK Government Cycle to Work Scheme you could save 25% on your next bike purchase. If your employee isn't registered then it is well worth checking in with your admin team to get them to sign up for tax free bikes and accessories which could further help you save in your bike buying process. If you would rather start off with something a little cheaper to see how you get along with cycling before you commit to a brand new bike then have a look at Bike Soup. They market second hand bikes via their website worldwide and their site is easy to use. 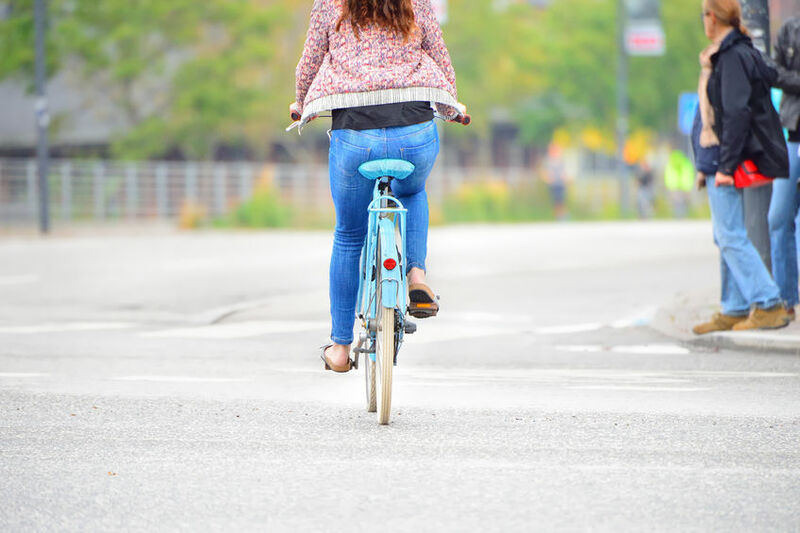 Cycling to and from work takes away the pressure to get a workout in and a lot of cities in the UK have cycle paths which means you don't have to spend a lot of time on the main roads which may be a little intimidating. The National Cycle Network has some great ideas on routes you can try in your area. Joining a local sports club can be cheaper than a gym membership and in some cases, completely free! Taking up a sport you used to play when you were younger or just joining a team to make some new mates are just a few good reasons to take up team sport again. Look up your favourite sport at your local community centre or just see what's available if you are keen to try something new. There are lots of sports that you could try such as Roller Derby which is HUGE in Scotland right now. It is hugely empowering for women and with a few friends now on some of the league teams, I can tell you it looks like a fantastic sport to take up to get fit with an added adrenaline rush! Email Communications Marketeer at Money Dashboard and my running buddy, Lauren Pyle, has a great tip for those looking to get into running without joining a club or hiring a personal trainer. The Change4Life Couch to 5k app is her secret to running a fair few miles every week. She runs home every day and built up to her 5 mile run commute by starting with this app. It takes you through a few weeks of building up your fitness by walking then running. Sports wear sales: Get suited and booted in the next sale and save money on expensive fitness gear.Keep a look out on sites like Sports Direct or your local running shop for flash sales or 'end of season' sales so you can stock up on year-round fitness gear. Don't 'just do it': Stay away from brand names like Nike if you are starting off. All you need is some hard wearing items that will get you through the next season and you can always reward yourself with something a little pricier if you stick to your new healthy habits. Make your budget clear: Always let the salesperson or specialist in the shops you visit know what your budget is before they start grabbing things off the rail! So for example. Go to your local sports footwear shop to get fitted for the right shoe and let them know your budget in advance so that they show you a range of well fitting trainers or boots to fit in your budget. They will often show you the most expensive footwear as any good salesperson would but if you make it clear from the beginning they should be able to help you find something a bit better for your wallet as well as your feet! Remember to use free budget planner, Money Dashboard, to help you keep track of your spending on sports kit using tools such as our spend tracker for 'sports kit' if you're on a tight budget. Hi, my name is Lisa and I'm Money Dashboard's Social Media Guru and all rounder Marketeer! When I'm not on Money Dashboard's Facebook and Twitter accounts talking to all our friendly fans and followers, I spend time looking at some of the new features on our website. My favourite part of the Money Dashboard app is the way all the information is easy to digest with the cool visuals it uses. Oh, and it's free to sign up. If you have a top tip for getting more active then do tweet us @Moneydashboard so we can get speaking about getting fit on a budget!